Carefully remove the blocks from the tower, and stack them on the top. The playable tokens include a Dragons Egg, Three-Eyed Raven, White Walker, Direwolf, Crown and The Iron Throne. Condition is New. Lead your troops. Build your empire. Risk it all. 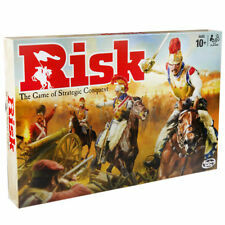 Risk is the classic game of strategic conquest where players are pit against their opponents as they try to take over the world. Craft your strategy & rally your army as you march across continents. Your army grows in strength as you take over territories, but don?t let down your defenses. Your opponents will fight back with everything they?ve got! Keep advancing until you?ve defeated all of your foes and taken over the world. This Guess Who? game goes back to the tabletop style boards, styled after the original, rather than handheld boards. Each player chooses a mystery character and then using yes or no questions, they try to figure out the other player’s mystery character. When they think they know who their opponent's mystery character is, they take a guess. If the guess is wrong, that player loses the game! Players can also challenge opponents to a series of games in the Championship Series, where the first player to win 5 games is the Guess Who? champion! Pictureka is an exciting game of visual hide & seek. Inside you’ll find 100 different mission cards in 3 categories. Can you find 5 big grins in 30 seconds? Be the first to spot the dinosaur? Find a stinky thing on your picture tile? 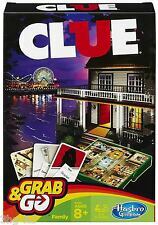 In this game it’s finders keepers: you get the card if you find the object(s) fast or first. Collect enough cards to win, and you’re the Pictureka champ! One false move and it's KERPLUNK as the marbles roll down the helter skelter marble drop. Marble fun for all the family. Watch the marbles spiral down the helter skelter marble drop. Pull out the straws as carefully as possible to stop the marbles falling. Guess and guess until you’re the winner in this handy on-the-go version of Guess Who?! Maybe it’s you in this Grab and Go version of the classic Guess Who?. Grab and Go version of classic Guess Who?. At the end of the round, score the words. The player with the highest score wins. For ages eight and up. What's in the box?. Be the last player standing to win. Two new moves! With Spinner’s Choice, the spinner makes up a move for the other player to do. Fun Spinner’s Choice ideas on the back of the spinner! If the spinner lands on Air, the player must put a hand or foot in the air! The classic Elefun game is back, and ready for a fluttery, butterfly chase! Now Elefun begins the game with a trumpet call, and plays music throughout the game as he blows colourful butterflies out of his 3-foot trunk! Players take their nets and race to catch as many butterflies as they can. The player who collects the most butterflies wins the game! Fun Disney Monopoly, cards are still unwrapped, obviously never played with but sadly Captain Hooks ship is missing and 2 cottages but an extra castle is there. The box is very good and the money etc never used. Players try to catch those bouncing bugs as fast as they can! Players press the button on the bed to make it start shaking, then use the tongs to be the first player to catch all of the bugs of their chosen color. Battle Forge. Who killed the host of the fancy party?. Where were they, and what weapon did they use?. 57 product ratings57 product ratings - NEW! 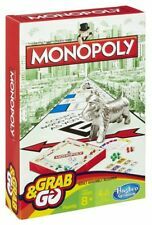 MONOPOLY COLLECTORS SPECIAL EDITION BOARD GAME 28 OPTIONS TO CHOOSE! Includes: 1 pie thrower, 1 throwing arm, 2 handles, chin rest, splash guard mask, spinner and sponge. Chow Crown Game from Hasbro Gaming - 2+ Players. Put on the crown then load the dangling forks with various food. The crown will spin and play music – and the challenge begins! Want more of a challenge?. The player who eats the most food wins. Get ready for the laughs as players catch the snacks. 5 out of 5 stars - Chow Crown Game from Hasbro Gaming - 2+ Players. 1 product rating1 product ratings - Chow Crown Game from Hasbro Gaming - 2+ Players. Monopoly Cheaters Edition NEW. Condition is New. Dispatched with Royal Mail 2nd Class. Includes 21 red checkers and 21 yellow checkers. Be the first player to get four in a row to win but you both get the chance to block the other's attempts to connect with your own checkers ! CONNECT 4 GRAB AND GO. Tour the city for the hottest properties, stations and utilities. Stay sharp, because there is only room at the top for one! Battle Forge. One player puts their chin on the chin rest behind the facemask. Then that player takes aim and launches the whipped cream (Whipped cream not included. The player behind the mask tries to avoid getting "pie-faced" by using the blocking hand. ). Play as Mario, Princess Peach, Yoshi, or Donkey Kong. Coins replace Monopoly money. Features Nintendo's Super Mario characters. FEATURING SUPER MARIO CHARACTERS. Monopoly Stranger Things. Rick & Morty. Star Wars Destiny. Adeptus Titanicus. Dungeons & Dragons. Arkham Horror LCG. Dead of Winter. Card Fight Vanguard. Cranium Junior My First Creative Game by Hasbro NEW. Condition is New. Dispatched with eBay delivery – Shutl 2-3 days. Rare edition of Marvel comics Monopoly. Monopoly - NINTENDO GAMER - Battle for the Highest Score. Mario Peach Yoshi Kong. Condition is Used. Dispatched with Royal Mail 2nd Class. Kids can have so much fun bee-ing quick to trick the bee! Players take turns picking a piece of honeycomb from the honey hive but they have to “bee” careful! The grumpy bee doesn’t want to share and just might jump out to scare the honey right out of a player’s hands! The last player to sneak a piece of honeycomb without getting caught by the bee wins the game. For two or more players. KerPlunk Board Game by Hasbro. Condition is New. Dispatched with Royal Mail 2nd Class. MARVEL COMICS COLLECTORS EDITION MONOPOLY. has been opened but not used. SIMON : ELECTRONIC LIGHTS & SOUNDS GAME - ORIGINAL EDITION IN VGC. Condition is Used. Dispatched with Royal Mail 2nd Class. Hasbro Gaming. My little Pony. Baby and Pre School. Baby Annabell. When one player runs out of money, the one with the most money wins! If no such action is taken, we will consider the products being as described, of satisfactory quality and fit for their purpose, and may not accept any rejection or cancellation at a later date. ELECTRONIC LIGHTS & SOUNDS. Made By Hasbro - Circa 2013. Stay calm or get the alarm. See who is cool under pressure. I don't think it has even been played with. Condition is Used. B ut like new only problem is there is a little tear on the box due to storage.